Last month, with my mother-in-law visiting us here in Singapore, we made a plan to visit one of the newest theme parks in South East Asia. it is to Asia’s first Legoland theme park located just a few minutes drive from the bridges that links Malaysia to Singapore in Nasujaya, Johor. Prior to visiting Legoland Malaysia, we purchased our tickets in a travel agency in Chinatown for discounted price. We got it for about 25% less from the regular price. Then we purchased separately the shuttle bus trip to Legoland and back via WTS Travel. And so early morning of a Saturday, we made our way to the Singapore Flyer to take our shuttle bustrip. We checked in near the Tours and Transfers Counter where buses are parked. We bought an 8:30AM trip to Legoland but we managed to get on a bus departed about 15 minutes earlier. Posted in Asia, Legoland, Malaysia, theme park. Tagged family oriented, Lego, Legoland, Legoland Malaysia. Twice in the past I had my opportunity of getting to this organized city south of Kuala Lumpur that has become the federal administrative center of Malaysia. Putrajaya was a brainchild project of Malaysia’s former prime minister Mahathir Mohammad to free up Kuala Lumpur from congestion. And so my first visit here was when we had a side trip to Kuala Lumpur during one of my previous visits in Singapore in 2005. On both occasions that I have visited the city, our trip here is always a side trip from KL. Posted in architectural wonder, Asia, Malaysia, Putrajaya. Tagged administrative center, Mahathir Mohammad, Putra Mosque, tallest minaret. The evening of Christmas Day 2009, we took a train ride from Singapore to Kuala Lumpur in Malaysia. This is a side trip in our week-long vacation in Singapore. At first we have planned for just a day’s visit by going back and for on the same day but we decided to book on a hotel instead and stay overnight since our baby Janine will be coming with us. We don’t want her getting too tired and we worry on keeping her feeding bottles clean. And so like I have always done in my past visits to the city, I booked ourselves on the midnight departure on board the KTM train that departs Singapore at 10pm for KL Sentral. This time we got sleeper berths instead of the usual seats since it may be uncomfortable for Janine when goes to sleep. We got upper sleepers when I booked online as the lower sleepers got booked fast. So when we got on board I tried to ask the guys on the lower sleeper if we can exchange. Luckily they agreed to exchange with us so we traveled on a lower sleeper while we put our bags on the upper sleeper. There was not enough space so the three of us stayed on the lower sleeper. Posted in aquarium, Asia, Kuala Lumpur, Malaysia, tour. Tagged Aquaria, best skyline in Asia, capital city of Malaysia, KLCC, Malaysia Truly Asia, must see, Petronas Towers, tallest building, twin towers, what to see in Malaysia. In one of my visits to Singapore, we have set up a plan to get a short tour to Kuala Lumpur, Malaysia. It was not my first time to visit Malaysia then as I had already been to Penang for business trips. 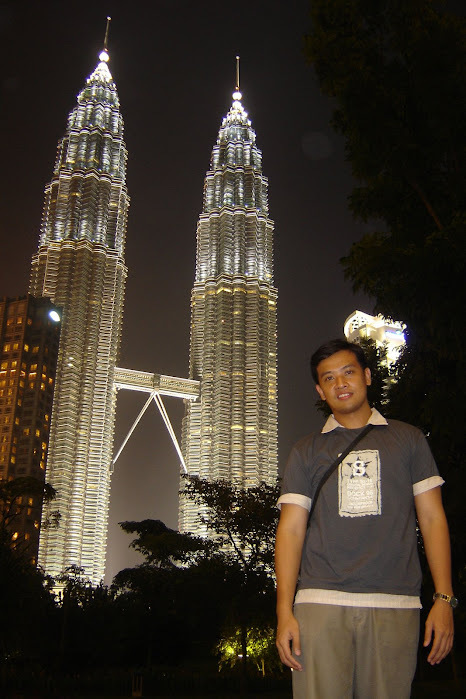 But on the May 27th of 2005, we decided to make a side trip to Kuala Lumpur to try and see the Petronas Twin Towers and the rest of the city. And so, I was again tasked to set up the whole itinerary going there. On this trip, there are six of us, my brother Mark and his wife Joy, Joy’s sisters Leslie and Jackie, and Jackie’s then boyfriend Chris. Well that time, my bro and Joy were still engaged. So, I looked up for a cheap accommodation in Kuala Lumpur. With the help of Travellerspoint, I was able to get our accommodation to Red Palm, a hostel. The hostel is located near Bukit Bintang, a shopping center in KL. And also from Singapore, I’ve purchased for us regular cabin KTM train tickets to KL Sentral station. And so at about 10 PM, our group made our way to the Tanjong Pagar KTM Station along Ayer Rajah Expressway in Singapore. We are booked on the 12 midnight trip to Kuala Lumpur. We have an expected arrival time in Kuala Lumpur at around 7AM the next day. I’ve planned the trip this way to save one night stay in a hostel. And so throughout the trip, we slept on our seats. About an hour later from the Tanjong Pagar station, we all alighted at the Immigration hall before crossing the Causeway Bridge to Malaysia. And from there, the train stopped in several other stations in Malaysia before we got ourselves to Kuala Lumpur. Posted in architectural wonder, Asia, Kuala Lumpur, Malaysia, Putrajaya, tour. Tagged Ampang, KLCC, national landmark, Petronas Towers, tallest building, wonder of the world.